A sermon preached by Rev. David M. Crawford at Rundle Memorial United Church, Banff, on October 2, 2011. Part of a sermon series on our stained glass windows. When I decided to do a series of sermons on our windows, I’ll confess the one in which we find Isaac Watts puzzled me. Why one for him? I mean, I knew he was a great hymn writer but there werer and are many great hymn writers. I couldn’t quite get the logic of including Watts alongside Calvin and Wesley, two theological and historical powerhouses. Of course a little research always helps. 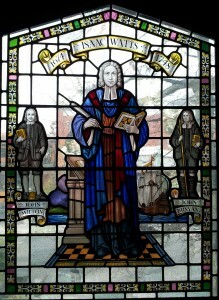 I discovered there is perfect logic in having a window for Watts, given his lifelong involvement in what were known as Independent, Non-Conformist or Congregationalist churches in England, those churches which were sort of loosely organized but were definitely not Church of England or Methodist. So, of course, it makes perfect sense: Calvin representing the Presbyterian stream in the United Church of Canada, Wesley representing the Methodists, and Watts the Congregationalists. Correspondingly on the other side of the sanctuary we have the Congregationalist Pastor Astor Schrag, then Methodist missionary Robert Rundle and finally Presbyterian Angus Robertson. Due to the fact that Isaac was not an Anglican he wasn’t allowed to attend Oxford or Cambridge, but did get a solid education and became pastor for a few years in one of those Independent churches in London. He contracted a mysterious illness, a type of fever, which forced him to leave ministry and which stayed with him till the day he died. He was often ill. These unfortunate circumstances allowed Watts to focus his intellect and creativity in the area of poetry and hymnody. Eventually he produced over 600 hymns, and became widely known as the “Father of English Hymnody”. We’re singing some of his hymns today but perhaps his best known hymn is a Christmas carol – “Joy to the World”. What was special about Watts? Well, in some ways he was ahead of his time, an innovator in the area of songs for Christian worship. In his era in England, regardless of denomination, it was common practice to keep mostly to the Psalms when singing in worship, the Psalms as they were, unedited. Watts led the way in expanding the church’s use of music, encouraging the inclusion of new poetry, not just the Psalms, new poetry that expressed the Christian experience of his day. He was influenced by Calvin in this, who himself, some 150 years prior, began translating the Psalms into the vernacular to enhance congregational singing. Watts also led the way in modernizing the Psalms, paraphrasing them in newer, more experimental ways. He hoped to arouse the personal spiritual dimension of one’s relationship with God, and therefore emotionalized his hymns more than was commonly done. Our communion hymn today is a great example of how Watts achieved his goals, a moving, personal, emotional hymn, “When I Survey the Wondrous Cross”. 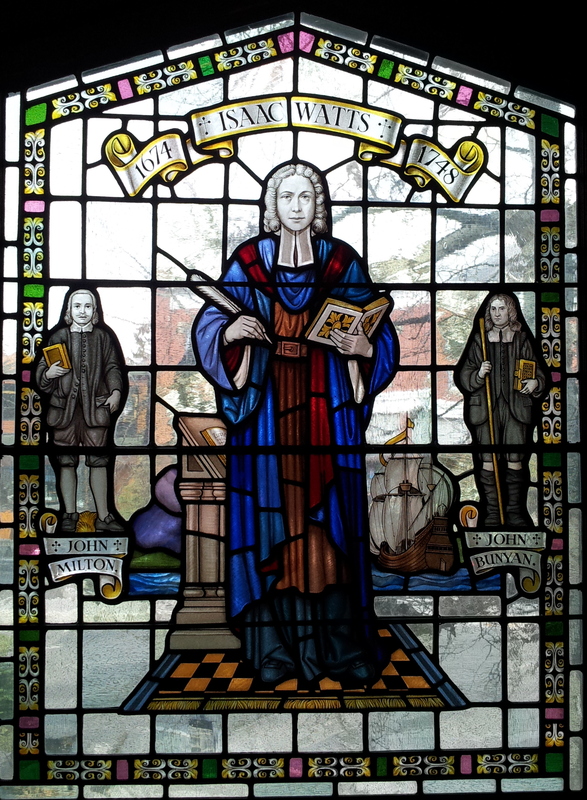 What can we learn from Isaac Watts, as a church in Banff in 2011? Perhaps something fairly obvious. The need to be open to change, reform, in the church. God is always calling us to seek new ways of being the church, new ways of expressing the faith, new ways of finding relevance in relation to the surrounding culture. There is comfort in the familiar, but is there inspiration? There is a sense of consistency and stability in the way we’ve always done things, but is there relevance for the modern spiritual seeker? It’s highly likely that in Watts’ day many were turned off, offended by his liberal paraphrasing of the Psalms, and by his own poetry. Yet in time his work became the standard, so to speak, and led new generations to experience faith, God, in new ways. cape singing to hords of women in Hawaii. My painting is the “pre-doughnut Elvis.” A touch of blue in the hair; the tall, white collar that suggests one of those 70’s polyester jump-suits; a pretty good-looking, got-it-together King. This is my Velvet Elvis. “But I think the best part of my Velvet Elvis is the lower left-hand corner, where the artist simply wrote a capitol “R” and then a period. Just “R”, because when you’re that good, you don’t even have to write your whole name. What if, when he was done with his masterpiece, R had announced there was no more need for anyone to paint, because he had just painted the ultimate painting? What if R had held a press conference, unveiled his painting, and then called on all painters everywhere to put down their brushes, insisting that since he had painted the ultimate painting, there was simply no need for any of them to continue their work? We would say that R had lost his mind. We say this because we instinctively understand that art has to, in some way, keep going, keep exploring, keep arranging, keep shaping and forming and bringing in new perspectives. “Over the centuries the Christian tradition has been influenced by change and growth and transformation. Jesus took part in this process by calling people to rethink faith and the Bible and hope and love and everything else, and by inviting them into the endless process of working out how to live as God created us to live. The challenge for Christians then is to live with great passion and conviction, yet remain open and flexible, aware that this life is not the last painting. We live in exciting, opportunistic, rapidly-changing times. How might we be open to change, to the Spirit’s influence, to become more relevant, to better serve God in our time? Isaac Watts serves as an inspiring example to us of loving God despite life’s challenges, and desiring to serve God through faithful change.